Enable custom options on grouped products in Magento® 2. Allow grouping configurable and bundle products. Create product check lists. Need to include configurable products into a grouped set? Or want customers to choose custom options directly on the grouped product? Magento doesn't show custom options on grouped products by default. It can turn your potential customers back as there is no ability to select the product size, color and other options. 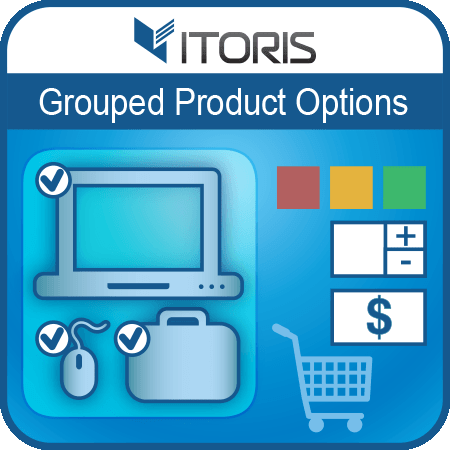 The Grouped Product Options extension for Magento 2 groups simple, virtual, downloadable products with options, configurable and bundle products. 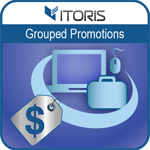 Now you can allow customers to choose custom options in grouped products without losing potential clients. You can group different types of products with options available in your Magento store. 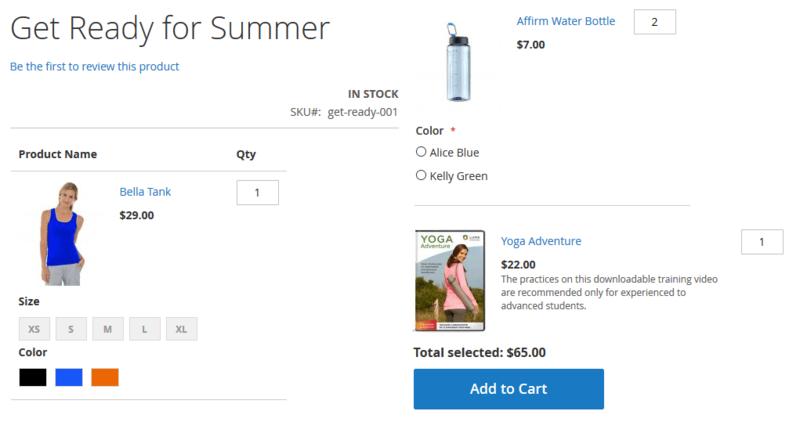 Your customers can configure grouped products before adding to the shopping cart. If you add a bundle product the available options will appear below the chosen product. If you group a configurable product you can enable color swatches too. All added products are listed on the grid in the grouped product in backend. You can specify the default quantity available for customization on frontend. 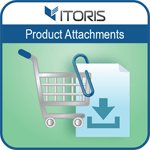 Enable the product short descriptions of associated products and let customers know about the products briefly or use it to describe all products' advantages. The product description will be available along with the customizable options. Just switch to the "Show Short Description for sub-products" option in the product settings and the description will be enabled. 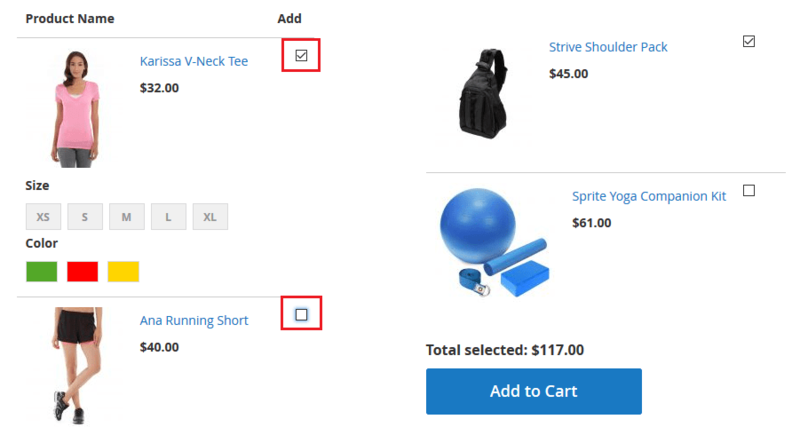 If you need to place multiple products on one page and make the list look more compact you can hide all images on the grouped product. All names are linked to the original product so your customers will see the products. The extension also allows to make all associated products either clickable or not. Now you can show all custom options of sub-products at once without clicking the product. If you add a configurable product the color swatches will be enabled automatically. After you choose the swatch option the main image will be updated. The total price calculation is available for each grouped product. 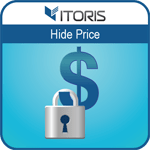 Your customers will see the final price including the price of paid custom options. 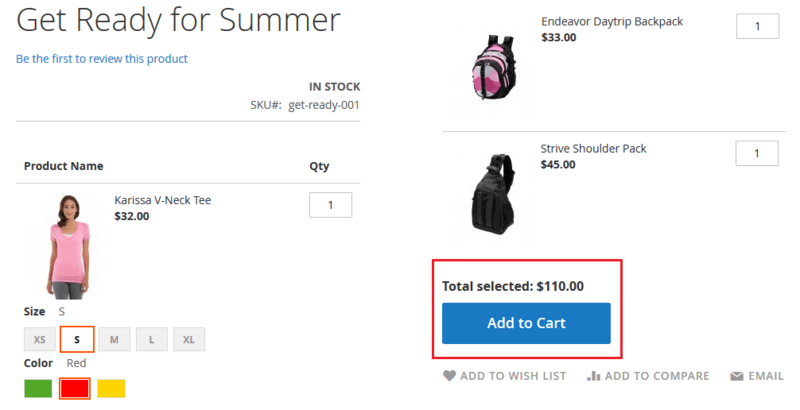 Let your customers calculate their budget before adding the grouped product to cart.